WPA2 security in Wi-Fi Broken? What that means to you. Also, hiberfile.sys and pagefile.sys, as well as the old lament: "But I AM the Administrator, darn it!" If you've purchased anything in The Ask Leo! Store in recent weeks, and you created a shopping account while doing so (not the same as a members.askleo.com account, I'm afraid), then you may have noticed that the ads on Ask Leo! disappeared thereafter. The short story is this: buy anything in The Ask Leo! Store, create an account when you check out and then as long as you're logged into that account there'll be no ads on Ask Leo! for a year. The long and surprisingly complicated story is that I'm working hard to make this an additional benefit to my Ask Leo! patrons. If you're already a patron, look for information soon on how you'll get the ad-free experience. It's just ... complicated to get there from here. If you're not a patron, you support Ask Leo! by purchasing Ad Free Ask Leo! for $2/month, or $24/year. Just create an account as part of the checkout process and you'll be all set. Earlier this week, a vulnerability was disclosed in the WPA2 security protocol that, in the worst case, could allow an attacker to potentially gain access to some or all of the encrypted information transmitted over a Wi-Fi connection. This isn't a bug, and it's not a failure of one manufacturer or another. This is a weakness in the protocol itself. If you use Wi-Fi on any device, it's worth understanding how big of a risk this might be, and what steps, if any, you might want to take. The single biggest mitigating factor for the average computer user is that this is a wireless vulnerability, and therefore requires proximity. You need to be using a Wi-Fi connection, and the attacker needs to be within wireless range of your computer. If you don't use Wi-Fi, this is a non-issue. Nothing to see here. Move along. If you do use Wi-Fi, then understanding your common surroundings is important. If you're in some isolated area where, like me, anyone close enough to listen in to your Wi-Fi would be obvious and out of place, it's possible you don't need to take any additional steps other than updating software, which I'll discuss below. Avoid sites that don't use https. Consider using your mobile device's data plan instead of Wi-Fi in sensitive locations. Or, if you can, switch to a wired ethernet connection. As it turns out, this is a relatively easy problem to address in software. As a result, most major manufacturers are pushing out updates that will fix the issue. Once your software is updated, you're protected. This applies to any and all devices that use Wi-Fi. And therein lies a different problem: not all devices will be updated. It's unclear if Windows XP or Vista will get fixes for this. It's pretty clear older versions of MacOS and Linux may not get updates. In short: if your operating system doesn't get security updates now, it's probably not going to be updated for this protocol vulnerability. You'll either have to live with it (see “steps to take” above) or update to a newer OS or device. And yes, I said “device”. One of the areas considered particularly problematic is that of Android tablets and mobile phones. Almost all are at the mercy of the mobile company from which they were purchased, and many of the older models still in use are not getting updates of any sort. Some will get updates quickly, and some not at all. It'll be important to know which boat you're in. When it comes to TVs and IOT devices, it's unclear when, how, or even if they'll ever be updated, and what the ramifications of that might be. One final point: the fixes apply mostly to Wi-Fi clients — the computers and other devices you use which connect to the network wirelessly. Wireless routers and access points, as I understand it, may not be impacted in the same way. Nonetheless, be on the lookout for updates to your router or access point's firmware related to this issue. There's one specific case that is impacted, and that's a wireless range extender or repeater. These act as both clients and access points. Since they act as clients, connecting to another wireless router or access point, they would likely be vulnerable to this issue. You'll want to update their firmware as soon as the manufacturer makes a fix available. How Do I Use an Open Wi-Fi Hotspot Safely? – Open Wi-Fi hotspots at coffee shops, airports, and other public places are opportunities for hackers to steal information and more. I'll review how to stay safe. Is cellular broadband more secure than WiFi? – Cellular is a popular internet connection alternative. As with any connection, it's important to understand the security ramifications and trade-offs. Internet safety: 8 steps to keeping your computer safe on the internet – Internet safety is difficult, yet critical. Here are eight key steps to keep your computer safe on the internet. 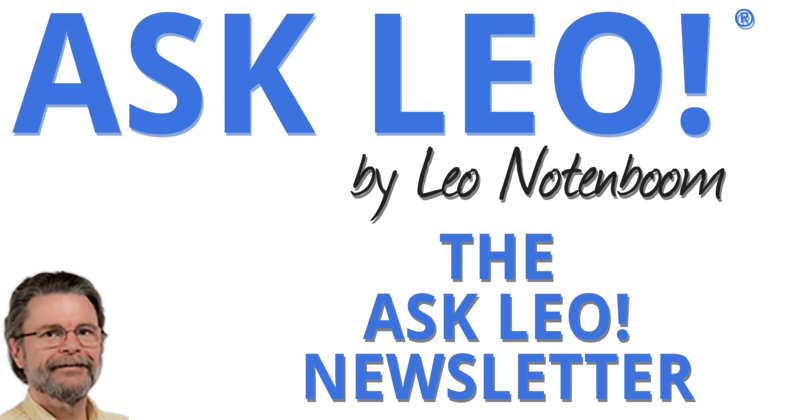 Purchase a subscription to Ad Free Ask Leo! for just $2/month, or $24/year. I recently noticed two huge files named hiberfil.sys and pagefile.sys taking up a bunch of space on my disk. I can't delete 'em, or if I do they come back when I reboot. What are they and how do I get rid of them? Hiberfil.sys and pagefile.sys are support files for two features in Windows. While you might be able to get rid of them, you might not actually want to. Continue Reading: What Are hiberfil.sys and pagefile.sys, and How Do I Remove Them? You're not the administrator. Not really. Oh, sure, you may think you're the administrator. Windows may have even lead you to believe you're the administrator. However, a security feature in Windows, on by default, means you're not the administrator. Continue Reading: Why Does My Computer Say I Need to Be Administrator, When I Am?